Much has been written about this machine of late; it is fast becoming collectible. Of course it has a right to be, being not just Sony Corporation’s first ever silver disc spinner, but also the world’s first commercially available CD player. It was launched on the 1st October 1982 (costing Y168,000), but reached the UK market in March 1983 at £800. Reflecting the fact that CD was a joint Sony and Philips technology, Sony delayed the international launch because its partner failed to meet the October ’82 deadline. 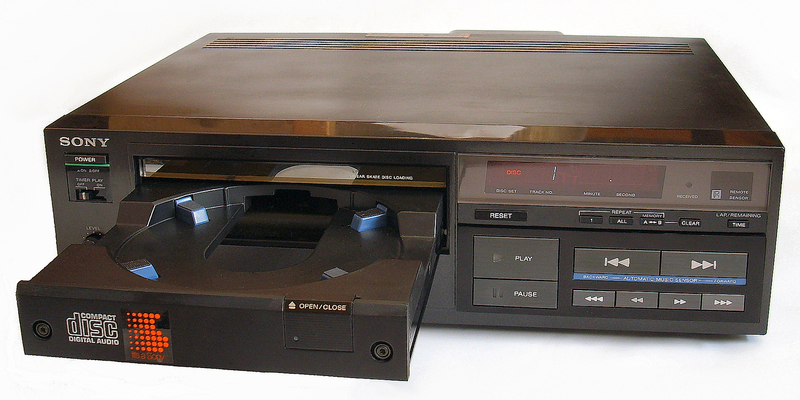 It was intriguingly different to Philips’ first machine, the CD100 – despite the two having quite a lot of shared silicon. The headline feature was the disc tray loader, a beautiful assembly precision crafted from aluminium – unlike the plastic drawers that later machines would use. The Philips CD100 by contrast used a top loading ‘drop in’ design, more similar to conventional analogue turntables. In the UK in Spring 1983, the Sony’s drawer loading system seemed impossibly exotic, even if they’re routine now! Accompanying this ‘surprise and delight’ feature was the digital vacuum fluorescent display which showed track number and playing time; again this was impressive stuff compared to the Philips CD100’s cheap row of LEDs. Factor in track access times which made its Philips rival look lethargic, and a full infra-red RM-101 remote control, and the Sony presented a fresh, hi-tech face to the outside world that stood in bold contrast to the rather more clunky and quirky Philips. In a sense the Sony seemed like a second generation machine to the Philips’ first. Sadly that gorgeous disc tray ended up causing many CDP-101s to be scrapped; the controller chips had a habit of failing, locking the disc in the machine – or out – and this is not an easy fix. It’s something worth remembering if you see a 101 at a bargain price; if there’s any hesitancy when opening or closing the drawer then prepare yourself for the sound of silence! The Sony uses a 16-bit DAC board, in contrast to the Philips’ TDA1540 four times oversampling 14-bit affair. The latter gave excellent sound, so it’s likely that Sony went for its own 16-bit design in the CDP-101 more for marketing than performance reasons. An array of Sony chips, including the CX-7933, CX-7934, CX-7935 and CX-20017, take care of digital-to-analogue conversion, and one look inside shows how crammed the midi-sized machine is. So much so that the mains transformer is located outside the case, along with a large heatsink. With relay-controlled, metallised touch-sensitive transport controls and that swish, chunky disc tray, the Sony feels lovely to use. Even the plastic case seems rather better than it really is, and overall the machine feels very special; a fully working example gives away little to the latter (and lovely) ES machines, for example. Using a first generation Philips machine seems like going back to the nineteen seventies, rather than the eighties! Sonically, it’s a funny one. The aforementioned time-smearing is an issue on some but not all music, but it doesn’t work wonders for soundstaging. Actually, it presents a bit more like a vinyl record played by a cheap moving magnet cartridge than most CD spinners; with a big, fat centre image but little in the way of image placement accuracy. It’s a nice effect actually, but not accurate. Tonally, some machines seem better than others. Extensive listening shows the players to be variable; perhaps a running change on the main board or a component substitution accounts for the fact that some sound quite plodding and matter-of-fact, while others are highly animated and musical, with an especially powerful bass. Having owned six CDP-101s over the years (and thrown as many away), I am in no doubt that there are two ’types’; one you will want to listen to, the other you will not. The Sony CDP-101 is a sweet machine, and quirky by Sony standards, but as a second-hand prospect it is more variable than most. It runs hot, causing some electrolytic capacitors inside to fail more quickly than you would expect, and there are the drawer controller issues and also the curious sonic variability. These days you’d want to own one for reasons of completeness for a collection, rather than for straight sound quality. The whackier Philips CD100 is a more satisfying performer, and now looks more ‘sci-fi’ too. Pay between £50 and £250 depending on condition and provenance.